22,000 more rice sacks from Sabah seized | Daily Express Online, Sabah, Malaysia. BASILAN: The Philippine Coast Guard (PCG) on Sunday again seized some 20,000 sacks of rice reportedly smuggled from Sabah. PCG officials said the smuggled rice were loaded in two Philippine registered wooden boats when it was spotted in Basilan waters. The PCG first spotted the M/L Overseas near Tamoc Island on Saturday. Upon inspection, authorities found some 10,000 sacks of rice without proper documentation. Minutes later, PCG again spotted M/L Nadeepa, which was found to have another 12,000 sacks of smuggled rice. 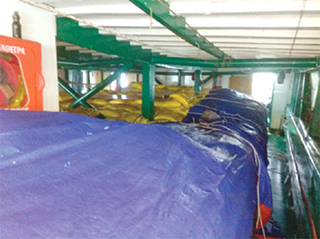 The shipments were brought to the Zamboanga City Port and turned over to the Bureau of Customs (BOC). Zamboanga City, Basilan, Sulu and Tawi Tawi has for so long relied on smuggled rice from Vietnam and Thailand which are brought into the country via Sabah and Labuan in Malaysia. Despite the decision of Malaysia and the Philippines to strictly curb illegal activities at the borders, traders continue to actively bring the smuggled essential goods. Zamboanga city was declared under the state of calamity last week as a result of the acute shortage of rice and high prices.